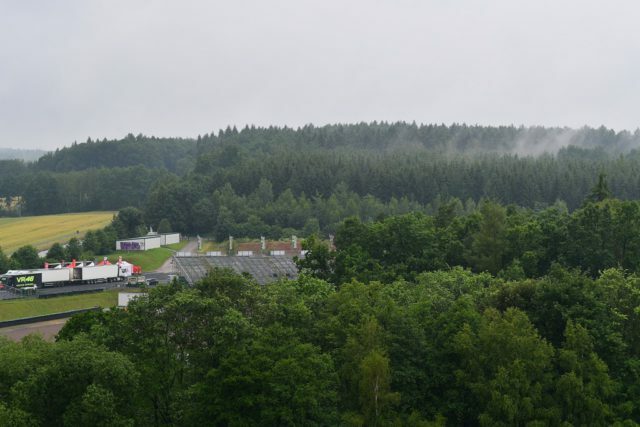 The German Grand prix at the Sachsenring circuit is almost the mid-season turning point for MotoGP. Last year the German racetrack celebrated its 90th anniversary. It was in Germany, at Nurburing in 1978, that a bike with Brembo brakes first won a race in the top category: the winner was Virginio Ferrari (Suzuki) with a gap of just 7 tenths over Johnny Cecotto. Sachsenring is the only MotoGP circuit that is less than 4 km long. And yet, it has 13 bends, 10 of which are left turns, and very short straightaways: the longest, before the finish line, is just over 700 meters. 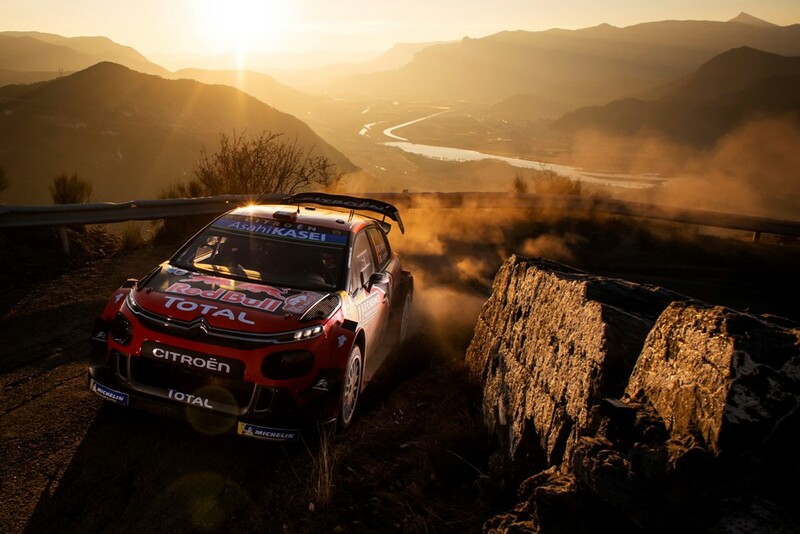 The winding racetrack means that brakes are used only moderately: 3 of the 7 braking sessions last for less than 2 seconds, while another lasts only 2.2 seconds. 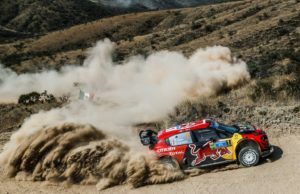 On the other hand, the short gaps between one bend and the next mean the brake system doesn’t have time to cool, and high temperatures make matters worse: in 2015 the asphalt reached 42°C during the race. 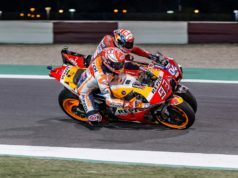 According to Brembo technicians, who assist 100% of the 2018 MotoGP pilots, Sachsenring is slightly demanding on the brakes. On a scale of 1 to 5 the track is with rank 3, the second lowest ranking for the summer after TT Circuit Assen. 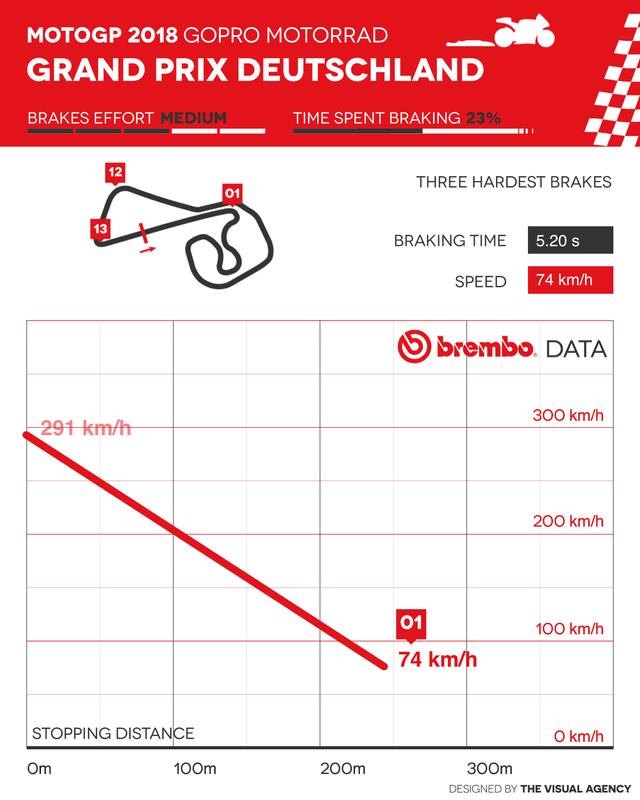 Throughout the lap, MotoGP riders use their brakes 7 times for a total of 210 braking sessions in the whole race. The 19 seconds per lap during which the brakes work are a negative record for the championship, being even less than the 20 seconds needed at Phillip Island, which only has 6 bends. Unlike the Australian track with only one deceleration above 1 g, Sachsenring stands out for at least 4 braking sessions of at least 1.4 g. But the three other braking sessions, at 0.6 g and 0.7 g significantly lower the average, bringing it down to 1.10 g.
The total of all the forces the rider applies to the Brembo brake lever from start to finish line is in excess of 900 kg, just a little more than the weight of 5 BMW HP4 Race bikes – the mass-produced bikes that use Brembo monobloc front callipers developed for MotoGP. 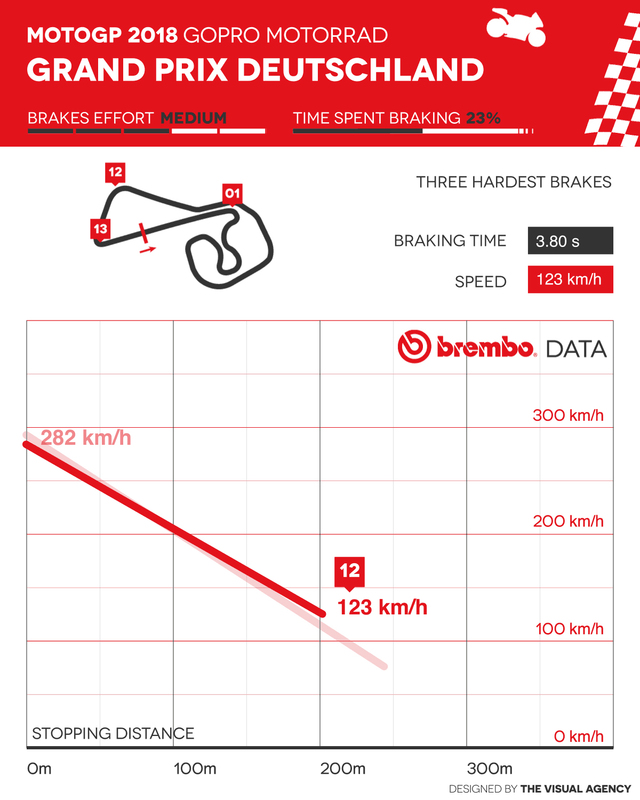 Of the 7 braking sections at the Sachsenring, only one is classified as demanding on the brakes, 3 are of medium difficulty and the remaining 3 are light. The first bend is the most demanding both on the riders and on the brakes: the bikes come up to the bend at 291 km/h and take the bend at 74 km/h after braking for 244 meters. The riders hold onto the brakes for 5.2 seconds and are subject to a deceleration force of 1.5 g. The pressure of the HTC 64T Brembo brake fluid is brought up to 10.6 bar, over 5 times the ideal pressure for a beer dispenser. The load on the lever (6.1 kg) is identical to the load needed for curve 13, right before the finish line. Brake fluid pressure is also identical, despite the fact that the braking session lasts 3 seconds as the MotoGP bikes travel 129 meters. On the other hand, the bikes come up to the bend at a slower speed (219 km/h) and stop braking at a higher speed (95 km/h). The riders use the brakes for less than 60 meters each for curves 2 and 3: 56 meters for curve 2 and 58 meters for curve 3, with less than a 3 kg load on the lever in both cases. 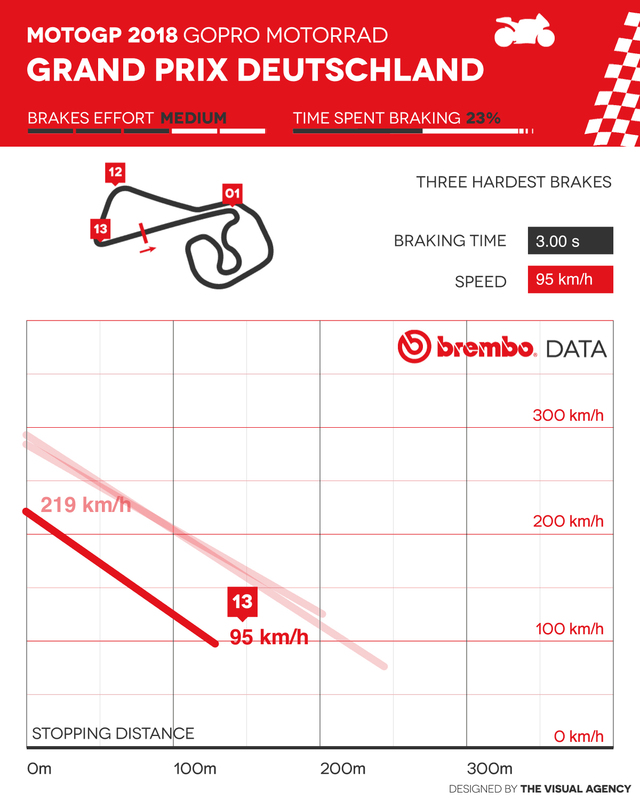 By combining GP Germany and GP East Germany, bikes with Brembo brakes have won a total of 31 races in the top category. If we limit the analysis to Sachsenring, not even one winning bike in 500 or MotoGP went without Brembo components. 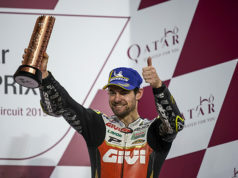 Honda won the last 8 editions: the first 2 with Dani Pedrosa, and the rest with Marc Marquez.